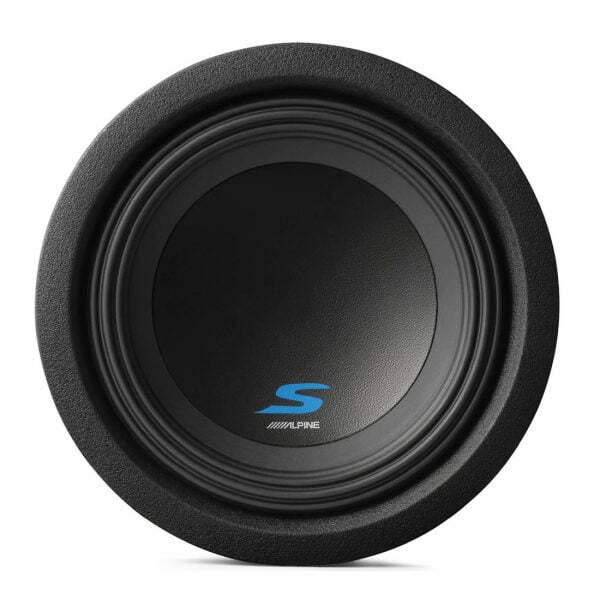 Alpine S-W8D2 8-inch dual-voice coil and reduced depth over previous models makes it easy to integrate this component into your system regardless of vehicle size. This Alpine S-Series subwoofer has a frequency response of 34-200Hz for dynamic lows on the road. The S-W8D2 S-Series subwoofers apply technology from their higher end subs to bring you the depth and punch that’ll make your tunes come alive. And to make things even better, these subs are about an inch shallower than their predecessors, making them great candidates for locations where regular high-power subs won’t fit. The push-type insert terminals help reduce the installation time of the S-Series subwoofers. Just strip the speaker insulation at the wire end, then insert the bare wire into the hole of the spring-loaded push terminal. The S-Series subwoofers use two strontium ferrite magnets stacked together, for increased motor strength and excursion which ultimately leads to more bass output. The S-Series subwoofers have concealed mount gaskets, creating a clean, finished appearance for any vehicle.